(Note: The Swansea Senior Scoop is funded by a grant administrated by the Executive Office of Elder Affairs. We thank them for their support. Each month the Swansea Council on Aging publishes a newsletter filled with details about current programs and upcoming events. 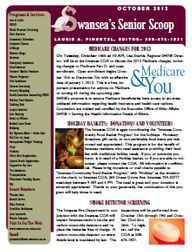 The Senior Scoop Newsletter can be found at the Council on Aging, Town Hall, Public Library, Continent Bakery, Ice Cream Barn, Martin Court, Ocean Grove Auto, Oakwood Senior Estates, Swan Mart, Swan Brook, Swansea Police, Swansea Vision and Shell Gas Station. You may also contact us to have a bulletin mailed to you or simply click on the link above to view our newsletter now! Click on the monthly buttons above to view.